Personalize your fall wedding with carved pumpkins and enjoy your pumpkin year after year...it will never rot! 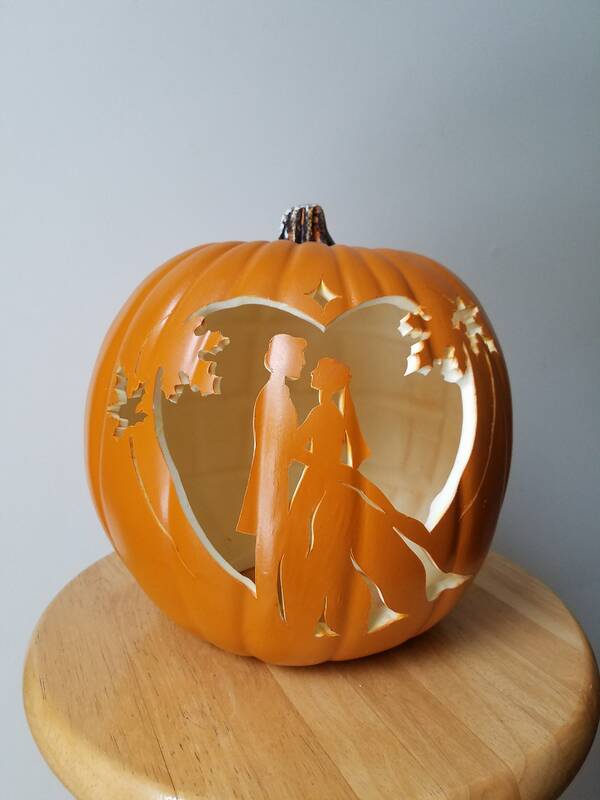 These customized pumpkins make great wedding and anniversary gifts! This 9" pumpkin is made of foam and is very lightweight. They may be placed outside on a covered porch but I highly recommend keeping them away from the elements. You can light your pumpkin with a battery operated candle ONLY. This listing is for the bride and groom as shown on a 9" pumpkin. There may be slight variations from the pumpkin you purchase and the picture. I hand draw and carve each pumpkin but am not able to always take a new picture of each one. A hole is carved in the bottom for a battery operated candle. I am happy to design a pumpkin for your wedding. Any custom orders will be shipped 1-2 weeks from the final confirmation on the artwork. Got this as a gift and the recipient's love it! Beautifully done and the recipient's are very happy with how it turned out! Good packaging too! Thank you so much! *I accept Etsy Direct Checkout, PayPal and most credit cards for payment. *Custom orders will not be started until payment is received. *PA residents will be charged 6% sales tax at the time of purchase. *Cancellations must be received within 24 hours after payment. Custom or personalized orders cannot be cancelled once final order is confirmed. If you have any questions, please contact my shop prior to finalization of your purchase to ensure your satisfaction. *I offer a money back guarantee for non-customized items listed in the shop. Only the purchase amount and any applicable tax will be refunded. The buyer is responsible for the original and return shipping and handling costs. Please note that some items are fragile and they will require additional care on return shipping. Please contact the shop if you need to return an item. *The refund will be processed once the item is returned in its original condition. *Refunds are available up to 7 days after receipt of purchase. *Please contact me to discuss any issues about the purchase. *Refunds are not available on custom orders once purchase is finalized. *All purchases will be shipped by USPS. If you desire a different delivery company (UPS or FedEx) or need your item quickly (Priority or Express shipping through USPS), please contact the shop for additional shipping options. The buyer will be responsible for any additional costs associated with shipping. *All international orders ship International First Class through USPS. The buyer is responsible for duties, customs and taxes levied by the buyer's country. I only ship to addresses verified, please make sure this matches your Etsy account. *Shipping time of custom orders will be noted on your order. The ship date for all orders is noted on your invoice. *Please notify the shop immediately if the purchase was damaged during delivery or loss in shipping. I will give you specialized instructions for return packaging and shipping. Don't like the colors? I can change the colors on most items to compliment your decor! Just email me with your suggestions. Please contact the shop first if you have any questions or concerns prior to leaving feedback. This would be greatly appreciated.